Isaac Gichura and his wife Jacinta Ndunge at Thika law courts on Tuesday. they denied inserting needles in their daughter’s body. 13 needles were removed from 10-month old Irene Wairimu by doctors at Thika level Five Hospital. Parents to the 10-month-old girl who was admitted to Thika Level Five Hospital with 14 needles in her body have denied committing the offence in a Thika court. 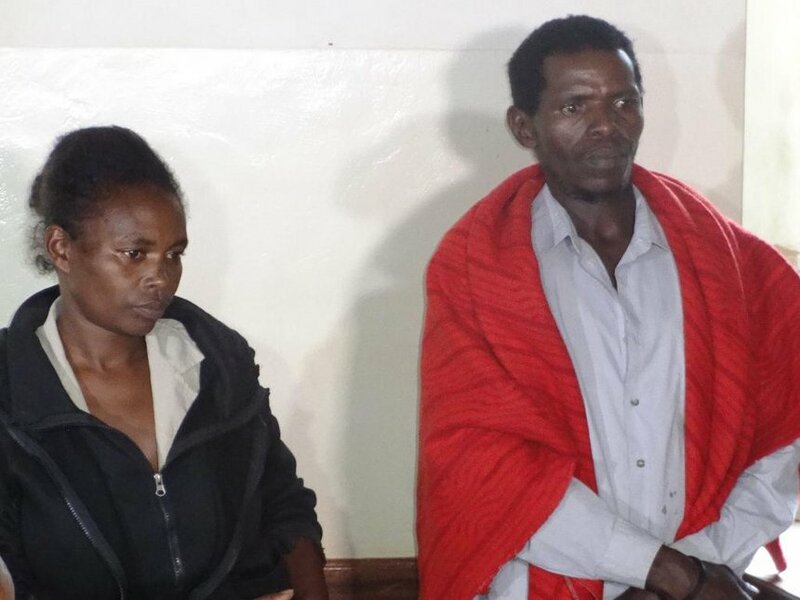 Isaac Gichura and his wife Jacinta Ndunge appeared before Thika principal magistrate Grace Omodho yesterday and denied inserting the needles in the minor’s body and putting her health at risk. The two had earlier pleaded with the court to release them on bond to look after their other three children. However, the prosecution led by state counsel Dorothy Aswani opposed their plea. They filed an application for the two to be detained until investigations are complete. Aswani told the court the accused would interfere with evidence. But Gichura, who works in a quarry in Kiganjo, pleaded with the court to free him since he is the sole breadwinner. He said the children are suffering with no one to take care of them. “I swear before God that I came to learn that my child had needles inside her body when doctors did an X-ray. There’s no way I can harm my own child. I plead with this court to release me so that I can feed my other kids,” Gichura said. Ndunge too asked the court to release her to go and breastfeed her baby. “I’m saddened that people are thinking that I harmed my daughter. If I didn’t want her I wouldn’t have raised her. Please release me so that I can go and breastfeed,” she pleaded. However, Justice Omodho denied their pleas and upheld the application by the prosecution. She ordered that they be remanded until December 11 when the case will be mentioned. Puzzle remains on how the needles ended up in the minor’s body since the parents claim not to know. The girl was rescued by Thika subcounty children’s officer Rebecca Kariuki on Monday and taken to Macheo Children’s Home as investigations to ascertain whether the case is a child abuse and neglect one continues. Doctors at Thika level Five Hospital said that they are still uncertain on how the needles found way to the girl’s behind. So far the doctors have managed to remove 13 needles through surgery while one that is said to be deeper in the girl’s body is yet to be removed.